Earn 120 - 720 points upon purchasing this product. Use 1200 - 7200 points to purchase this product! This formula is based upon the Enzyme-Blocking Therapy by Dr Matthias Rath contained in his book available here for download: There is also a PDF brochure covering the findings of his incredible experiments below. 1. 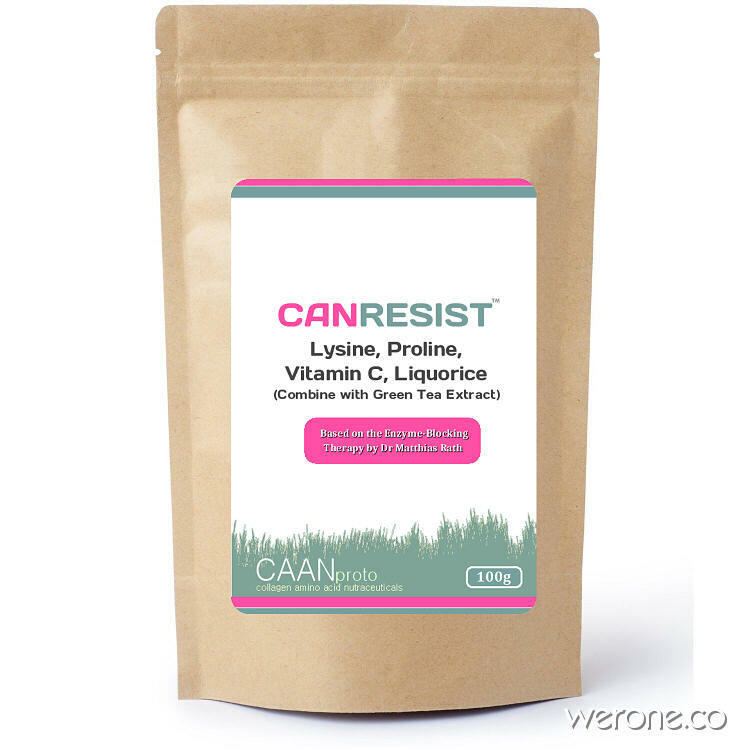 Lysine inhibits the destruction of the connective tissue by preventing enzymatic digestion of collagen molecules. At the same time the amino acid lysine is a component of collagen and it is used for making the collagen in the body. 2. Vitamin C stimulates the production of the connective tissue and is essential for its optimal structure. Deficiency of vitamin C leads to tissue weakness and eventually to scurvy. On the other hand, an optimal supply of vitamin C assures optimal production of collagen and elastic fiber molecules and contributes to having strong connective tissue in the body. For best results combine CANRESIST with Green Tea Extract (50% EGCG) which according to this study, may provide a synergistic effect in blocking the process of metastasis. Other useful ingredients may be AlgaeDHA, or Omega3 /DHA, Bone Broth (if you’ve had Chemotherapy) , Vitamin B12, Melatonin , AdrenalREST/ Iodine , CStemhib and Reishi / Cordyceps mushrooms. For an interactive bio-search tool of health concerns linked to nutritive modalities/ protocols see our BiohackIT. “Our results suggest that the formulation of green tea extract, lysine, proline, and ascorbic acid, tested as a promising adjunct to standard treatment of pancreatic cancer, by inhibiting MMP expression and invasion without toxic effects important parameters in cancer metastasis.” Pubmed 15879623. https://www.ncbi.nlm.nih.gov/pubmed/15879623” . Studies have shown (source), that adequate collagen production can also help support strong coronary arteries, cartilage and bones, as well as improve the function of the organs, which are cemented by collagen fibers. Key Synergy Nutrients: Vitamin C, L-lysine, L-proline, Liquorice, MSM, + Green Tea extract (not included). L-lysine: An essential amino acid, is a building block of collagen. L-lysine helps maintain healthy connective tissue. L-lysine is not produced in the body and supplementation is necessary to help protect support of the body’s connective tissue. L-proline: Another amino acid, is a building block of collagen that also strengthens the body’s connective tissue. This nutrient is produced by the body in limited quantities, so additional supplementation is important to ensure the optimal production of collagen. Liquorice – components reduce inflammation via NF-kB pathway and cause cell cycle arrest by down-regulating cyclin D1 and E, key molecules in G1 to S transition and completion of the latter one. Ultimately, the cell cycle arrest will trigger cell cycle deregulation and apoptotic processes via upregulation of p21 and p27, both well-known tumor suppressor proteins downregulated in numerous cancers. Add 5g to 15g of the powder to a glass water and drink twice a day. Higher dose for intensive results. At higher dosages 200g would last 7 days and 800g 1 month.